Chino (the "Optics Dude")'s professional background in Optical Science and Engineering, with a B.S. in Physics from the University of Pittsburgh and M.S. in Optics from the University of Rochester (New York) neatly complements his aviation enthusiasms. "Go Play in Space" (Second Edition) by Bruce Irving. 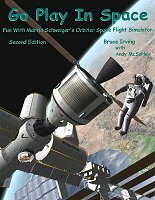 Fun with Martin Schweiger's Orbiter Space Flight Simulator. This Introductory Tutorial manual is a colorful picture book about humans going to Mars, how they might realistically go about this, and where this might lead in the future. Check out Chino's Blog and enjoy his intelligent and witty raves on flight - sims - space sims and music! A person who is extraordinarily focused on something that average people would consider weird, overly complex, or merely boring... they end up figuring out the universe and designing and building all the stuff that defines the modern world.